The Healthier Environment Living Program! Keeping up with the FLU! Track important flu information in your area! What is BioShield XMICROBE™ Technology? The Healthier Environment Living Program™ offers a unique Disinfecting & Protecting service to reduce or completely eliminate the bacteria, mold and microbes that are dwelling in your home or business that you can’t see. By blending our XMICROBE™ Microbiostatic Agent Protectant with our XMICROBE™ Neutral Disinfectant Cleaner on-site creates the XMICROBE™ Technology that we are very to proud to offer. There are no better results offered in the industry today. The Healthier Environment Living Program™ consists of many affordable, long lasting solutions including anti-microbial protection and air & surface testing for Healthier Verifications™ performed by our Indoor Air & Surface Quality (IASQ™) Professionals. XMICROBE™ Technology is a patented, EPA Registered revolutionary new product. XMICROBE™ Technology prevents the growth of an amazingly wide array of bacteria, mold, mildew, algae and yeast. XMICROBE™ Technology acts like a bed of microscopic spikes that pierce the cell walls of microbes. XMICROBE™ Technology is a totally new approach to providing long lasting anti-microbial protection. What benefit do You get from areas that are treated with XMICROBE™ Technology? XMICROBE™ Technology continuously fights the growth of microbes that can cause stains, odors and product degradation. XMICROBE™ Technology protection makes the surfaces in your business easier to clean and keeps them cleaner and fresher between cleanings. 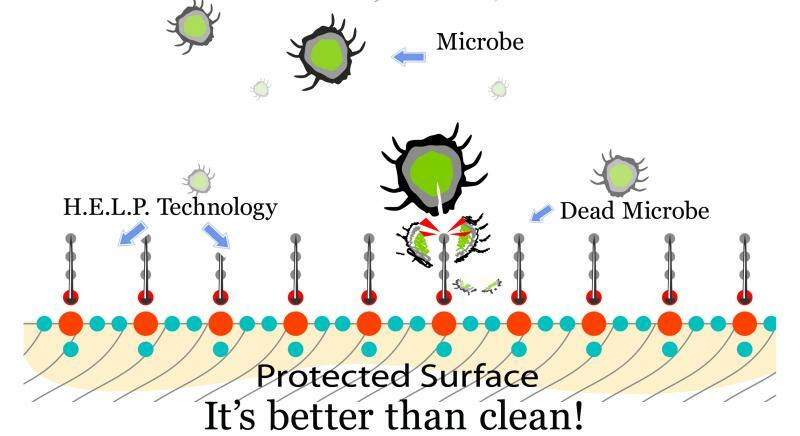 XMICROBE™ Technology is applied to porous and non-porous surfaces and will not wash off. XMICROBE™ Technology is engineered to provide continuous antimicrobial product protection for up to ninety (90) days or greater, keeping the products in your home or business cleaner and fresher for longer than ever before. 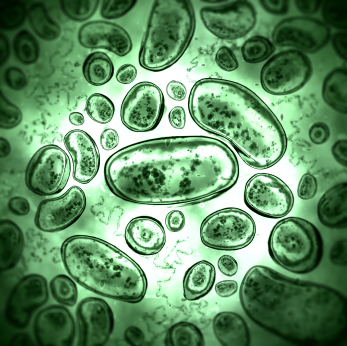 Plus the XMICROBE™ Technology is a GREENER Solution to eliminating dangerous microorganisms in your home and business. XMICROBE™ Technology takes a totally unique approach. It provides long-term control of growth on treated surfaces because the surface itself is modified to make it antimicrobial active. The active ingredient in the XMICROBE™ Technology forms a colorless, odorless, positively charged polymer, which chemically bonds to the treated surface. You could think of it as a layer of electrically charged swords. When a microorganism comes in contact with the treated surface, the sword punctures the cell membrane and the electrical charge shocks the cell. Since nothing is transferred to the now dead cell, the anti-microbial doesn't lose strength and the sword is ready for the next cell to contact it. XMICROBE™ Technology protection continuously fights the growth of microbes. Plus, the XMICROBE™ Technology protection makes the surfaces in your home easier to clean and keeps them cleaner and fresher between cleanings. For decades Aldo Sammarco has been famous for two things - Great Haircuts and Soccer! A Bedford Hills, NY icon, Aldo is the founder of the Bedford Soccer Club Inc and has been teaching local children of all ages how to play soccer for over 30 years. Most of those "kids" are also his customers...and Aldo cares about his kids! When he learned about Advanced BioShield from another customer, Aldo was eager to understand how the product worked and all of its benefits. It wasn't long before "Aldo's Barber Shop" was the next satisfied customer of Advanced BioShield of Westchester. From a health standpoint Soccer is a great way to keep fit and healthy , but exercise won't kill germs or stop a virus. "In my work I am required to keep all of my combs, razors, and clippers sanitized" he said "and I have the equipment to do that. But it's hard to do so with the rest of my shop." Every week dozens of customers sit in the same chair. "I can't change the chair between customers, but now I can make sure it's protected from everyday germs." Now all of the shops surfaces; chairs, walls, bathroom, and even the magazines have been sprayed and are protected with advanced BioShield technology. Aldo wants all of his Customers,"Kids", and their families to know that "clean" play makes for good sport and that a clean environment makes a healthy environment. " I don't want to loose my star players to the flu. Do I?" We couldn't agree more. Dr. Steven Bellantese - A Westchester First! 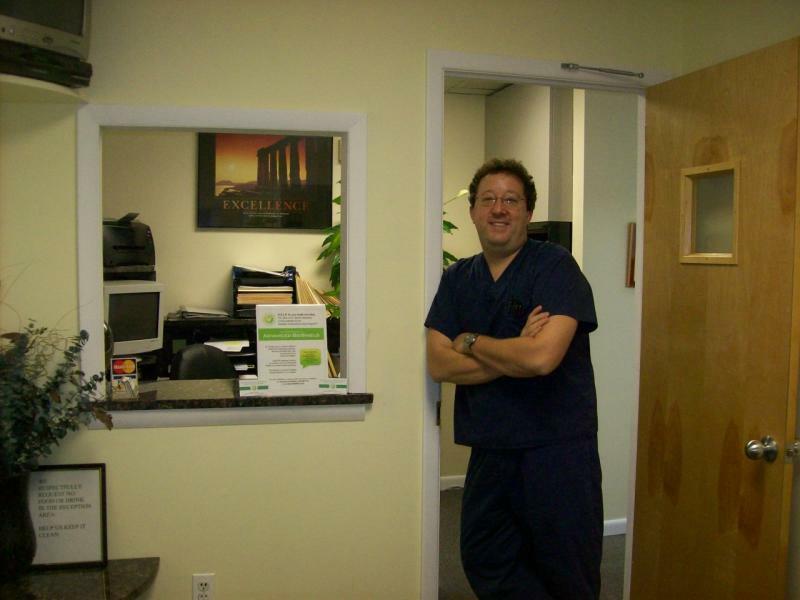 Dr. Steven Bellantese DDS, is proud to be the first medical professional in Westchester County, NY, to adopt the Healthier Environment Living Program at his office in Bronxville. As with most practitioners, Dr. Bellantese gets new patients through referrals from existing patients and other professionals. . "I want patients to know that I have their best interests in mind and that I am proactive in protecting their health on several levels" , " I like the fact that BioShield is applied to ALL types of surfaces - especially hard to protect surfaces like carpets and furniture." With XMICROBE taking care of the little things Dr. Bellantese can concentrate on the big things -his patients! One important aspect of the H.E.L.P. program that helped him make his decision to apply the system was the fact that BioShield products are water based and environmentally friendly. He liked the idea that products are shipped in "condensed" form and mixed on site. This allows for less material waste and lower shipping weights - all good for the environment. Also important was the fact that the XMICROBE protectant was non-chemical in its anti-microbial technology - "Nowadays people tend to shy away from poisons and chemicals whenever possible, so the mechanical kill properties of the product fit perfectly with an ecological mindset - I like that." Mt. 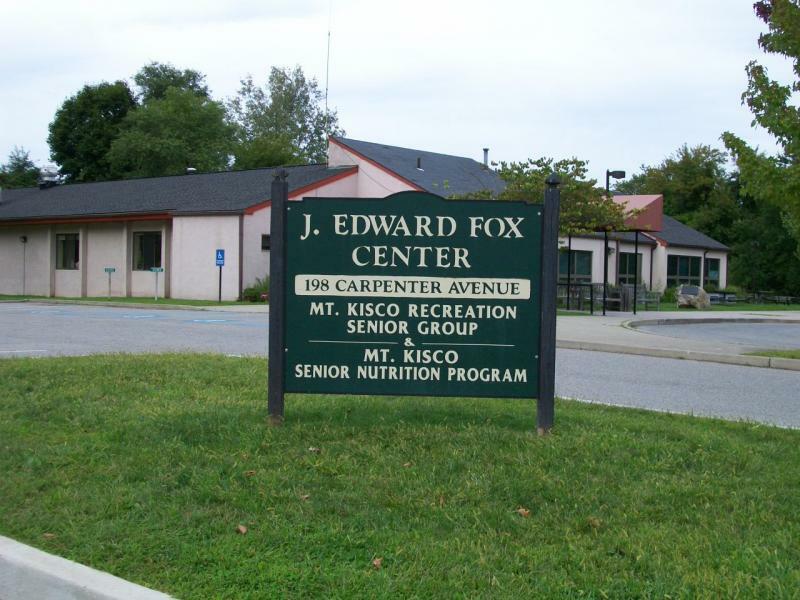 Kisco Senior Center gets H.E.L.P ! Knowing that Senior Citizens are most at risk for Flu and related problems, The Center's Management team jumped on the opportunity to help protect them from getting or transmitting germs within the community's tight knit Senior population. "With the generous consideration from Check Mark and Advanced BioShield we feel that we have raised the bar in the quality of service we provide," remarked Jean Arra, the centers Senior Nutrition Program Director. Having a deep understanding of the importance of keeping a clean dining facility Jean recognized immediately how utilizing a long term protectant would benefit the center. "We hope other Senior Centers in the county do the same." Liz Dieter, the centers Recreation Supervisor, was impressed with the ongoing results of the Healthier Verification Testing in the areas outside of the dining area. "You can't argue with the test results" she said, "The number is right there in front of you." Now that we have seen the results inside the center we are going ahead with treatment of our transport vehicles also" stated Dieter. Charles Pieragostini, Mt. Kisco Recreation Commissioner, who oversees all of the towns recreation facilities was also impressed and has made the decision to treat the Village's public pool facility. "It is easy to see how adopting the H.E.L.P. program will improve the cleanliness of our bath house and changing facility. We are always concerned about mold growth due to the wet conditions we operate in and reducing or eliminating fungal growth will cut down on the possibility of spreading simple things like Athlete's Foot." " I also like the fact that our primary season can likely be protected with a two part one step application - that saves time and money! Research Shows...Your Home Is Germier Than You Think! According to Dr. Joseph Mercola, “germs in the home can show up where you least expect them, even if you diligently try to keep your home clean. Despite good efforts by most to keep their homes germ free, over 65 percent of colds, 50 percent of all cases of diarrhea and 50 percent to 80 percent of food-borne illnesses are caught in the home, and common household items are often to blame. Bottom line: New research shows…Your home may be germier than you think! Out of 32 places in the home, the top spots for bacteria are the toilet bowl, kitchen drain, kitchen sponge or counter-wiping cloth, bathtub, and kitchen sink., according to a new study. The study and survey come from the Hygiene Council — which is funded by Reckitt Benckiser, the company that makes Lysol. Researchers visited 35 U.S. homes, swabbing for bacteria in 32 locations in each home. Here’s how those spots ranked, in terms of the average number of bacteria per square inch. Spots with the same average number of bacteria have the same rank. And if that isn’t bad enough, another study by the National Institute for Health showed that Bacteria in Household Dust Triggers Asthma Symptoms. New research shows that bacteria lurking in household dust produce chemicals that may trigger asthma and asthma-related symptoms such as wheezing. These bacterial chemicals, called endotoxins, particularly those found on bedroom floors, were linked with increased respiratory problems in adults. Researchers at NIEHS and the University of Iowa found a strong association between endotoxin levels and the prevalence of diagnosed asthma, asthma symptoms, asthma medication use, and wheezing. These relationships were strongest for bedroom floor and bedding dust. So what is a homeowner to do to try to protect the family from all of these dangerous microorganisms? The best solution is to take a different approach to managing the environment inside your home! And the Healthier Environment Living Program™ is just what you need! It makes complete sense to take a “holistic approach” to determine what kind of germs, bacteria, viruses and microorganisms are present in your home before determining what type of actions are needed to keep your home as germ and bacteria free as possible. Protect your family and ease your mind as XMICROBE™ Technology works 24/7 to control Microbial growth. Dr. Carter’s Patients Are Getting H.E.L.P. As a General Surgeon and Head of Wound Care for a metropolitan hospital, I look for ways to benefit my patients in their constant struggles against bacteria and a host of other infections. Other than topical washes and education about controlling their condition, there was little I could do for them. That is no longer the case! Thanks to the Healthier Environment Living Program™ there is now an environmentally friendly program that is highly effective in destroying a host of harmful bacteria and other dangerous microorganisms. The Healthier Environment Living Program™ consists of 3 valuable tools in achieving healthier indoor environment; Education, Testing, and Solutions are key components to the program and what medical professionals look for in treatment of their patients. My Healthier Environment Living Program™ professional tested and treated my office, my waiting room, my clinical facility, and my home. In all cases elevated bacteria counts were reduced to exceptional levels. I highly recommend to every patient I see to implement to Healthier Environment Living Program™ into every facet of their daily lives. Their homes, laundry, work spaces, and vehicles should have this protection applied. Swine Flu ... XMICROBE™ Technology Kills the H1N1! The EPA has stated that any disinfectant that offers kill claims against Influenza A. will kill the H1N1 virus. Our XMICROBE™ Technology has such claims. Call today to have one of our IASQ™ Certified Inspector Professionals come to your home or business and offer long term protection.